A weeder for the big ones. Before the era of chemical weeding, when slicing, prying and yanking were the weed removal methods of choice, weeding forks were the big guns. Sometimes called spade forks, these tools were used to pry overgrown, tap-rooted perennial weeds such as dandelions, docks and thistles. Almost always two or three-pronged (occasionally, four) they came with or without a tread. Ours is forged from 5/8" rod with a 1/2" crossbar that doubles as a step for driving the fork deep into the ground and a fulcrum for prying with the stout handle. 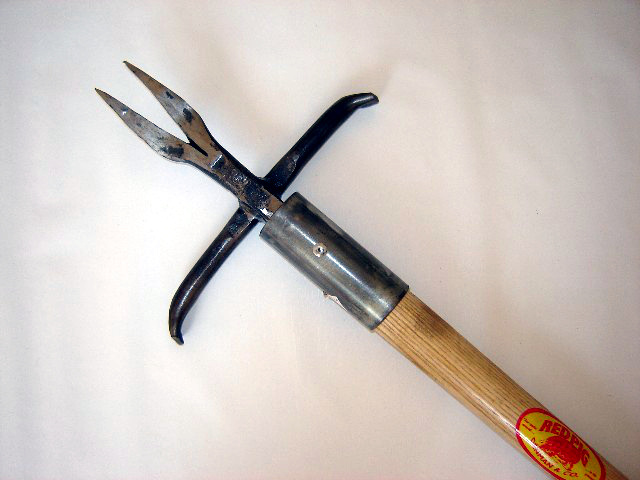 If you live on rural acreage and eschew Round-Up, Crossbow and other weed killers, this is your tool. Total length about 57-60". The size, shape, and weight of this item means we must charge an additional $10 shipping fee to our flat rate shipping rate to accommodate for the actual cost of shipping it.